Want to build a sprawling, multi levelled station that caters to your Meeple's needs? Focus on trade, mining and research whilst keeping your hapless Meeple alive by generating power, life support wiring your station up. Set up a botany department in the basement, only to have a fuel line cut and set fire to it. Fix leaks caused by your fuel line not being maintained, or bits of your station lacking oxygen due to an open airlock. SCIENCE! Remember kids, failure is fun. 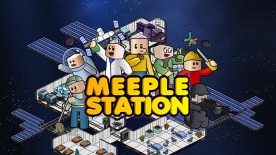 When something goes wrong, it goes REALLY wrong in Meeple Station. Your officer could decide that the airlock isn't necessary and deconstruct it, wiping out half your station, only for a stray meteor to hit your solar array, powering down your life support while everyone is snoring away in bed. Trade any of the myriad of goods you scrounge up. Become a mining station, strip mine entire quadrants and sell the runoff to a trading faction nearby but be wary of pirates and face eating space-squids.